I am greatly influenced by my years as a landscape designer in Cairns, drawing plans and botanical illustrations and am continually inspired by the patterns of nature, fabrics and Eastern styles of art. I fell in love with lino carving while studying printmaking in NSW. Although I have experimented with other techniques, I still enjoy the flexibility and challenges of lino printing the most. I gained a certificate in Printmaking from Lismore Tafe and have completed a course with the inspirational Dianne Longley at the Central School of Art here in Adelaide. I continue to study in the arts and recently delved into photopolymer printmaking . 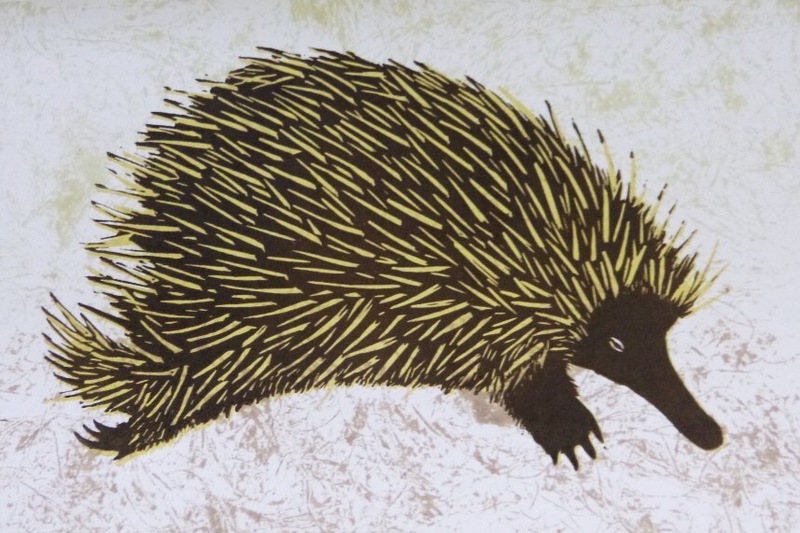 This Lino print showcases one of our iconic Australian animals. It's unique backwards facing hind feet are designed for digging and pushing away the soil in search for food. Grevilleas are part of an ancient group of plants with a profusion of diversity and form, and who belong to the Proteaceae family, which includes the well known Banksias. The Proteaceae are named after the old man of the sea Proteus, who in Greek mythology was a shape shifter. This print highlights the Grevillea flower structure transforming into a new and unique state.